The Soybean Promotion, Research, and Consumer Information Act established the national soybean checkoff program in 1990. The Department of Agriculture established the United Soybean Board, a farmer-led organization, to administer the program on a national level. Many soybean growing states also have a Qualified State Soybean Board (QSSB) charged with collecting and administering the checkoff on a state level. In Illinois, the Illinois Soybean Board (ISB) serves as the state’s QSSB. The soybean checkoff is assessed at the rate of one-half of 1 percent (.005) of the net market price of soybeans sold by the producer to the first purchaser. Checkoff assessments collected by Illinois first purchasers must be remitted to the Illinois Soybean Board by the last day of the first month following the end of the quarterly sales period, as illustrated in the chart below. Checkoff must be withheld and remitted to the Illinois Soybean Board for all types of soybeans purchased, except for those producers who possess a valid organic soybean exemption certificate. Form LS46 must be completed and accompany the quarterly checkoff remittance payments. Fill out the LS46 form to the right. 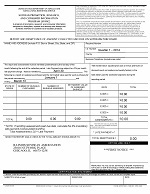 The form will automatically calculate the remittance amount due and can be printed out and mailed with your payment. Please fill out the online form. You will then create pdf, print and sign. Please print the pdf, fill out and sign the form. 1. What is the rate for the Soybean Checkoff? 0.5% or .005 (one-half of one percent), 50 cents for every $100 of sales. It is to be collected on the net sales price. “NET” is after moisture and quality discounts or premiums, but before any deductions for storage, handling, trucking or other services. 2. Can a producer get a refund on his bean checkoff? As of October 1, 1995 refunds from the National Checkoff were eliminated. However, in those States where the State program is authorized or required to pay refunds, the producer may direct that his or her total assessment be forwarded to the United Soybean Board by requesting a refund from the State program. The authority for this is found in the Order at Section 1220.228 “Qualified State Soybean Boards” paragraph (v) (A) that reads: If the entity is authorized or required to pay refunds to producers, and request from producers for refunds for contributions to it by the producer following the termination of authority to pay refunds, will be honored by forwarding to the Board that portion of such refunds equal to the amount of credit received by the producer for contributions to its pursuant to section 1220.223 (a)(3). 3. What is the required number on the LS-46 Form and where do I find it? The required number on the LS-46 Form is a number that is generated from the Illinois Soybean Board. This number will begin with a FP and it is used to help us identify your name and elevator location. If you cannot locate this number you may contact the ISA office at 309-663-7692 and we can give you this number over the phone. 4. What happens if I paid too much for a quarter? Beginning December 2013 you must request a refund authorization from our office if your elevator overpays its checkoff. An amended LS46 Remittance Certification form and sufficient documentation verifying the overpayment must be submitted with any request for refund. Once the office of the Illinois Soybean Board has reviewed the documentation a refund will be issued. 5. What if I pay late? Pursuant to federal rules (section 1220.223, paragraph 5 (iii) © (2)), a two percent penalty, compounded monthly, is assessed to first purchasers who do not remit payment by the last day of the month which follows the end quarter. If your report is postmarked after the date due, you are not entitled to keep the 2% collection fee AND you must add 2% of the gross remittance to your report. 6. Is this money used for any Legislative Campaigning? Checkoff money cannot be used for any Legislative Funding. 7. What is the checkoff money used for? 8. How can I get more information or who do I contact for help? You may contact the Illinois Soybean Board at 309-808-3619.